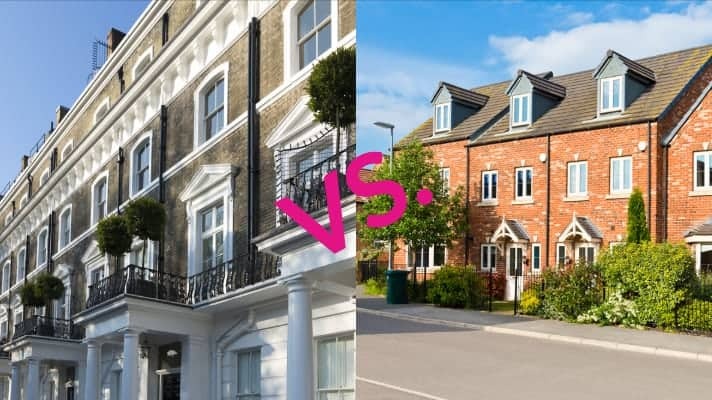 Period Homes vs New Build Property - what are the pros and cons? New build vs old house? It’s probably the biggest dilemma that faces anyone looking for a property. For some, period equals charm and character, while new builds are perceived as boxy and soulless. For others, the chance to move straight into a perfectly packaged home is irresistible. Not sure whether you want period charm or contemporary style? Here are the pros and cons of traditional vs modern. There’s no doubt that period homes have bags of character. But where some potential homeowners swoon over period features like original fireplaces, mouldings and beams, others sense trouble. If you prefer to live maintenance-free, then the guarantees that come with a new build deliver peace of mind as well as modern convenience. Buying a period property means you need to be realistic about your ongoing costs and general upkeep. Energy efficiency or cosy charm? As we become ever more environmentally conscious, new builds score highly for energy efficiency. Not only can you go greener, but you’ll drive down your running costs with a home that is considerably cheaper to run. Period homes are often more solidly built than new builds, using environmentally friendly materials like stone and timber. But they can be difficult and costly to retrofit, with energy saving innovations like solar panels and heat exchange pumps making them far more expensive to run. Sprawling space or contemporary and compact? With a new build, you get what you see. And that’s often a pocket handkerchief garden and cramped interior space – the smallest on offer in any European country. Period properties are generally built on larger plots, giving them family-sized gardens and plenty of interior living room. Older homes are often built in convenient locations surrounded by valuable infrastructure, while some new builds can be out on a limb without access to shops, schools and transport. Character homes in towns and villages tend to be within walking distance of all local amenities. It always makes sense to invest in property to which you can add value. New builds, like new cars, start to depreciate in value as soon as you move in because the value has already been optimised. A period property often gives you outside space for an extension, or a loft or basement to convert, giving you the opportunity to create extra living space and add significant value. Ultimately, the decision is a subjective one. If you want to move into a premium property chain-free, then a new build will be your first choice. Love character and charm and the chance to improve? Then period is right for you. Be aware of the pitfalls as well as the positives of your chosen property and Home Estate Agents can help you find your dream home.